Original Editor - Joshua Samuel. 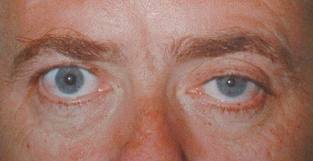 Horner's syndrome results from an interruption of the sympathetic nerve supply to the eye and is characterized by the classical triad of miosis (ie, constricted pupil), partial ptosis, and loss of hemifacial sweating (ie, anhidrosis). Appropriate treatment of Horner syndrome depends on the underlying cause. The goal of treatment is to eradicate the underlying disease process. In many cases, however, no effective treatment is known. Prompt recognition of the syndrome and expedient referral to appropriate specialists are vital. Whether surgical care is indicated and what type is appropriate depend on the particular cause of Horner syndrome. Potential surgical interventions include neurosurgical care for aneurysm-related Horner syndrome and vascular surgical care for causative conditions such as carotid artery dissection or aneurysm. ↑ von Passow A. Okulare Paresen im Symptomenbilde des "Status dysraphicus", zugleich ein Beitrag zur Ätiologie der Sympathikusparese (Horner-Syndrom und Heterochromia iridis). Münchener Medizinische Wochenshrift. 1934;74:1243-9. ↑ Krasnianski M, Georgiadis D, Grehl H, Lindner A. [Correlation of clinical and magnetic resonance imaging findings in patients with brainstem infarction]. Fortschr Neurol Psychiatr. May 2001;69(5):236-41. 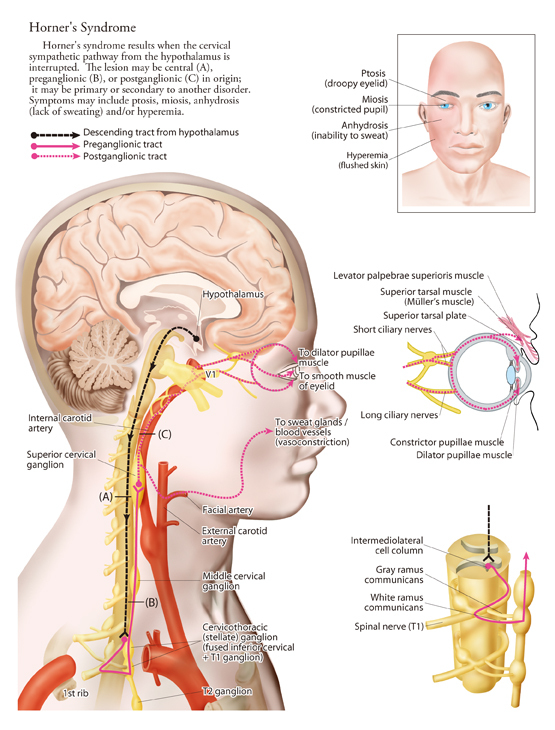 ↑ Biousse V, Touboul PJ, D'Anglejan-Chatillon J, Lévy C, Schaison M, Bousser MG. Ophthalmologic manifestations of internal carotid artery dissection. Am J Ophthalmol. Oct 1998;126(4):565-77.